I’m a big fan of the montage — a device in movies used to move the story along. The characters grow, change and learn, all while accompanied by a great soundtrack. I need this for my studio. 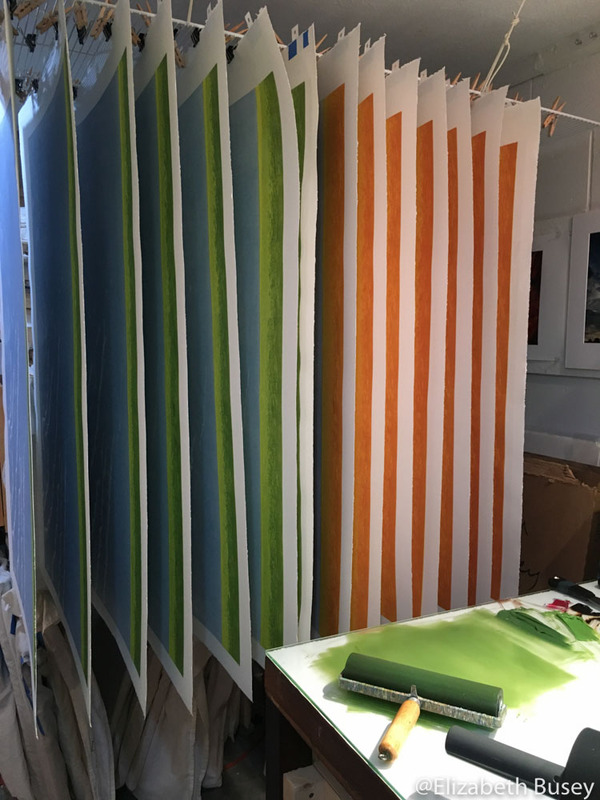 I am back printing my large (25 x 40 inch block) linocut, and patience has been required at every turn. My latest linocut, hanging to dry after a trying printing session. My image is a large cloud formation, over a small area of flat land. I couldn’t decide whether this was summer or autumn land, so I did some of each. With such a large block, I would hate to guess wrong. 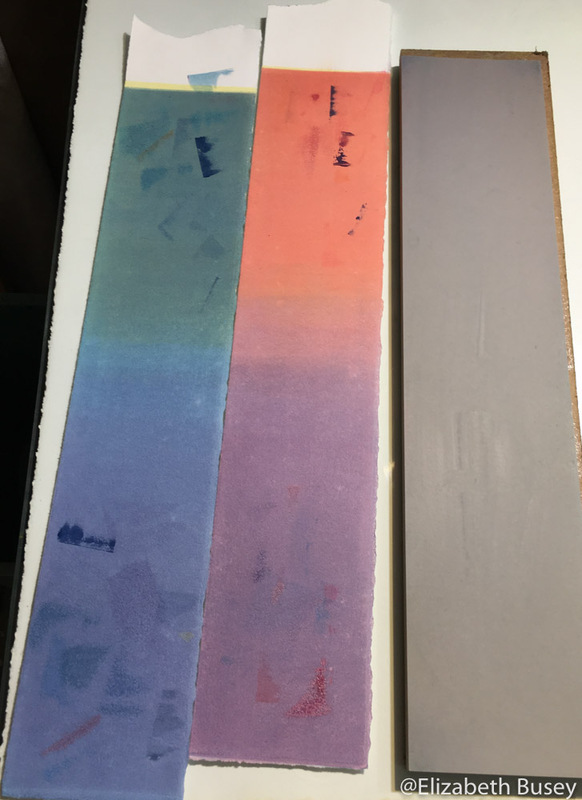 I used a frisket (or a mask for non-printers) to help me lay down some of the bright colors of the land which will contrast with the darker, more monochromatic clouds. This is not an exact process, as I discovered when I printed the first layer of blue. My measurements must have been off, because it overlapped the land in a small band! My initial reaction was to try and carve away a thin strip or linoleum, but this a dangerous operation. I could carve away too much, and would then be left with an inexplicable slice of exposed white paper. Like a very itchy insect bite, I had to tell myself, don’t touch! This area will be covered by the darkest ink anyway. More problems came as I printed the first and second layers of transparent blue. There is something about the combination of lots of transparent base and just a touch of pigment that leads to a gummy residue on the block. After every four prints, I had to clean off the block to prevent this residue pattern from transferring onto my paper. I have found that the first transparent layers of a linocut often look terrible, but are incorporated into later layers with no trouble. Again — don’t touch and don’t fret! Wouldn’t a fast forward button and a great soundtrack be perfect right now? This entry was posted in Techniques, Uncategorized and tagged carving, frisket, ink, Linocut, patience, reduction, transparent on July 28, 2016 by Elizabeth Busey. 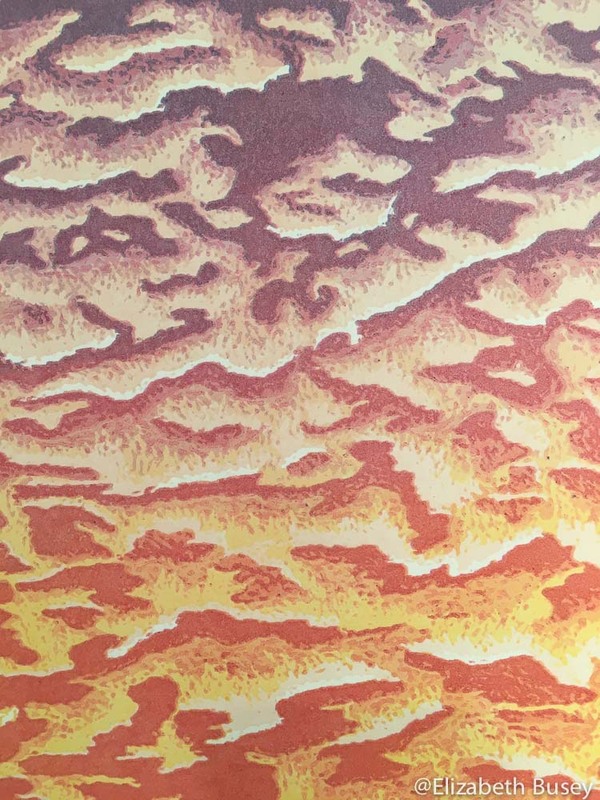 Sunset illuminating clouds — in progress. I’m exploring the effect that the setting sun would have on a blanket of clouds. I wanted the brightest parts to be either completely white or a warm yellow. The task then was to choose colors that will provide the dimensionality of the clouds, and then the dark (by contrast) blue and purple sky. Watercolor chart created during election night for Bush v. Gore. I wonder if I will have some more nights like this during the current U.S. political season. Intuitively, I want the lowest parts to have purple shadows, and the upper part to have a dark-greyed teal. But how to get there is the question. Purple over the yellow yields a rich brown, a color only associated with tornado clouds. 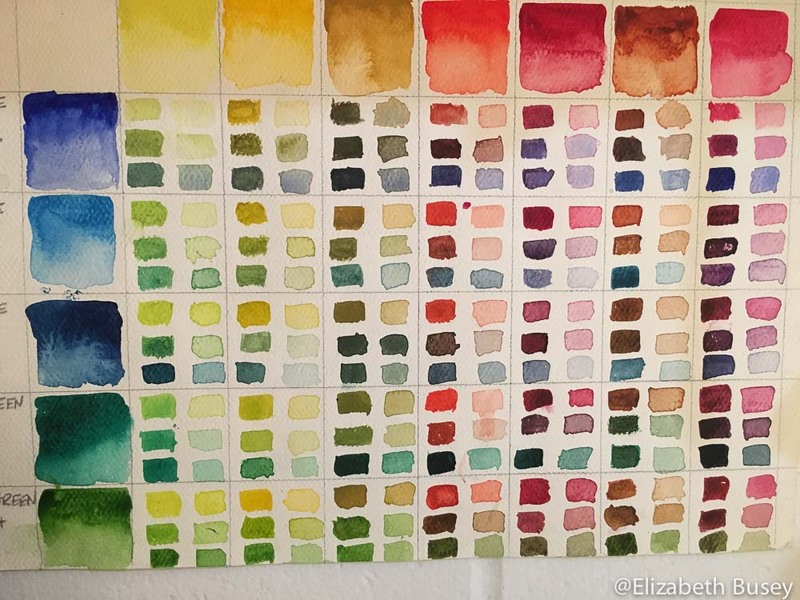 I use this color chart to give me ideas of which way to head. I created this chart on the ill-fated election evening of the Bush vs. Gore election. Hour after hour we watched to see if a winner would be declared, and instead watched the newscasters flounder about in confusion. Mixing these watercolors kept me grounded. Stripes of two different colors look the same when placed on different colored grounds. 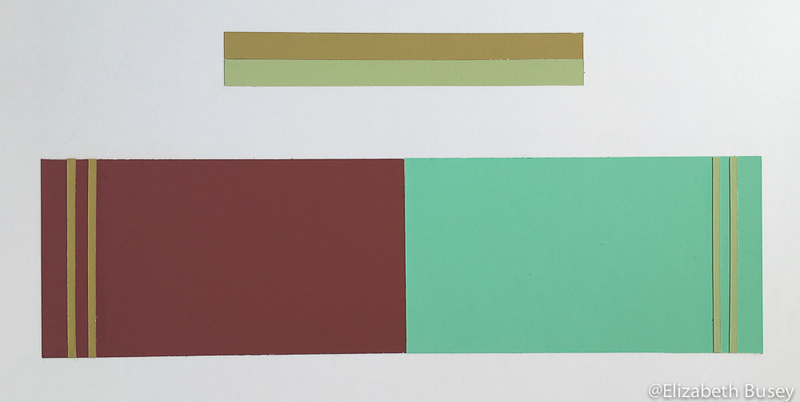 In this example, the challenge was to take two different colors, and using different backgrounds convince the eye that it was seeing the same color. The colors I used are at the top, and then shown on top of two other colors. The illusion is helped by keeping the stripes away from each other. 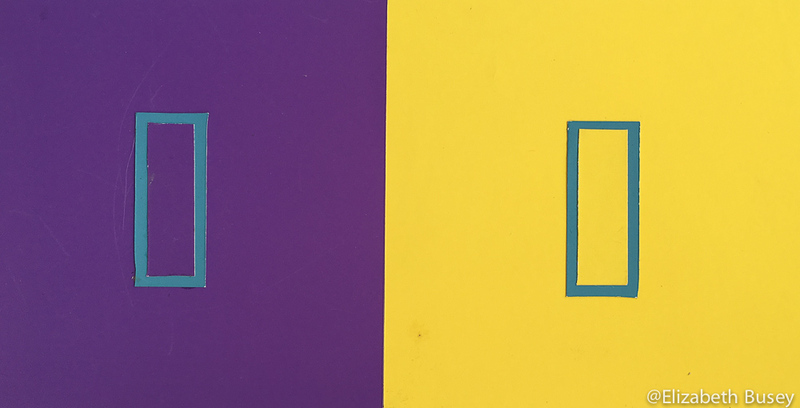 Rectangles of the same blue green paper look markedly different on purple and yellow grounds. In this example, the blue green paper is the same on each side, but your eye is challenged by the different color fields of purple and yellow. 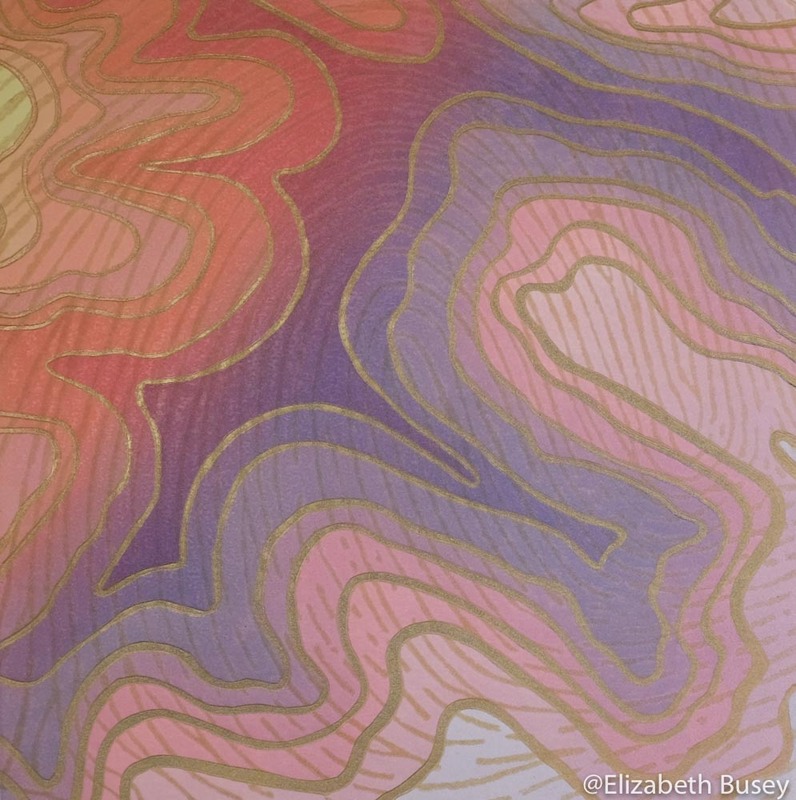 This entry was posted in Color Theory, Composition and tagged clouds, Linocut, opaque, paper, reduction, transparent on March 16, 2016 by Elizabeth Busey.